Newshosting is thriving to be one of the best Usenet service providers which offer excellent Usenet service by giving their users the full access to Newsgroup and NNTP for private and business users. They have an excellent retention days and completion rates that make them a major contender and the best Usenet search feature provider. A new feature was recently added to their package which is the VPN feature to safeguard and protect data online. It can be paid for with the packages to serve as an add-on or can also be paid for as different subscription. All these are the determining factors which make them one of the favorite providers. 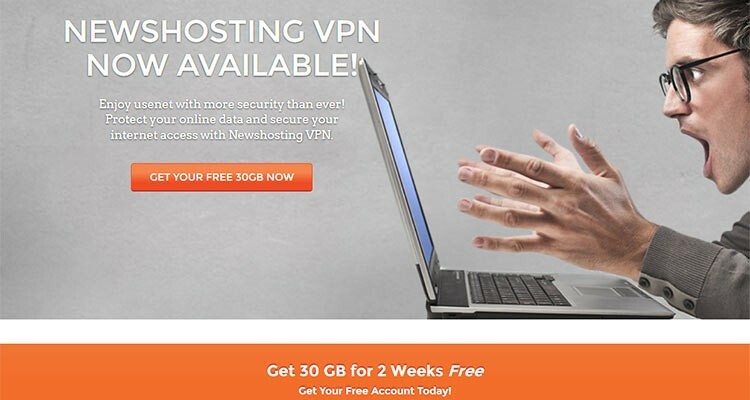 Newshosting respects the privacy of their users which makes them introduce the new VPN features to ensure that their server is highly secured. This VPN feature is for personal use either you are connecting from a public Wi-Fi, or you are trying to open content from another country, want your identity to be anonymous online .Then VPN feature is what you need.You can purchase it as add-ons with any of the packages or as a separate subscription. • Protection of your Identity and Data. Newshosting VPN features to secure your online identity and data with easy to use software service. download contents from their favorite newsfeed. choose depending on how much or little you do use Usenet server. up to 30 connections, this is an ideal package for the basic users. to 30 connections and a VPN feature. Subscribe for any of these packages and get an unlimited connection to Newshosting server. you could ever think of. you may be going through.